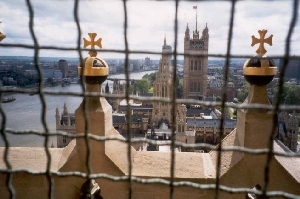 Although not as high as, and less massive than, the Victoria Tower, the Clocktower is probably the most prominent and certainly the most famous feature of the Palace of Westminster. The foundation stone was laid in 1843 and the tower was completed 13 years later in 1856, the same year in which the original Big Ben bell was cast. The tower rises to a total height of 316 feet. The masonry walls rise to the height of the belfry. The spire above this point is an iron framework construction. The lower part of this framework supports the bells. There are three separate shafts in the tower. The clockshaft, which contains the weights which drive the clock rises from the ground to the clockroom. There is an old ventilating chimney which was originally used to ventilate the building but is now disused. The third shaft contains the staircase which rises to the height of the belfry, just below which there are four gargoyles at the corners. The lower part of the tower contains several rooms, among them a prison cell. 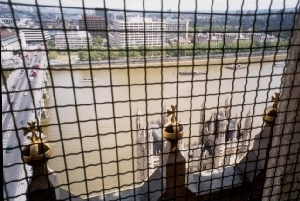 There are some excellent views to be had from the tower as the following pictures show. The dials were designed by Augustus Pugin. The design is of an elaborate iron framework of diameter 23 feet supporting 312 individual pieces of opal glass, rather like a stained glass window. Some of the glass pieces may be removed for the purpose of inspecting the centre of the hands. 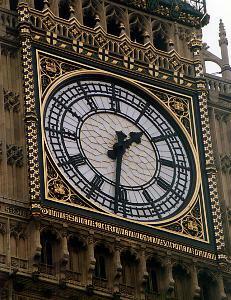 The numerals (each 2 feet high) are unusual in displaying 'IV' rather than the usual 'IIII' on clocks. The surround of the dials is gilded lavishly. Cleaning of the dials is undertaken from time to time by window-cleaners who abseil from the balcony in front of the belfry arches. The cleaners must be especially careful not to obstruct the hands which could stop or slow the clock. Last carried out in August 2001, this is an operation which attracts much attention from the public. The inscription beneath the dials reads 'DOMINE SALVAM FAC REGINAM NOSTRAM VICTORIAM PRIMAM' which means 'Lord save our Queen Victoria I'.